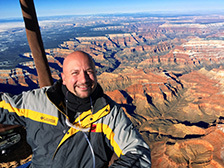 Apex Balloons' Owner & Chief Pilot Jon Radowski poses for a portrait at 16,960 feet above sea level, over the Colorado River, halfway across the Grand Canyon, on December 16, 2015. You can see a huge grin under Jon's oxygen mask as he flies just under 18,000 feet above the South Rim of the Grand Canyon in a hot air balloon on January 17, 2010! One of our hot air balloons lifts off with a neighbor in Phoenix, where Apex Balloons offers daily flights. Taking a hot air balloon ride over the Grand Canyon in Arizona is a dream shared by many people. In reality, there are about the twice as many balloonists who have ever accomplished this incredible balloon flight as there are astronauts who have walked on the moon. 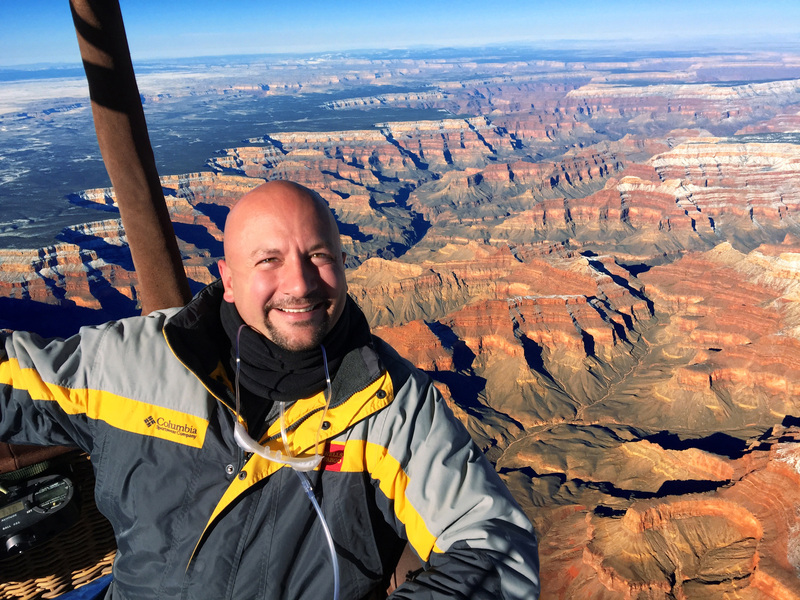 Owner of Apex Balloons, Jon Radowski, has done it multiple times, and proudly offers exclusive private charter hot air balloon flights across the Grand Canyon. Arguably the most famous national monument in the United States, and perhaps the most scenic location in the world, the Grand Canyon offers a backdrop for what is certainly the most incredible and most exclusive hot air balloon flight ever offered to the public. 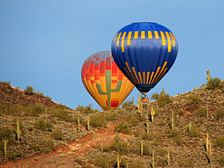 Apex Balloons offers private charter hot air balloon flights over the Grand Canyon from November through March. Weather conditions must be ideal, and passengers must have a flexible schedule. It is not a "daily" flight - it is a special expedition that requires a significant amount of planning and specific weather conditions in order to accomplish. Note: Others may claim to offer balloon flights at the Grand Canyon, but nobody else actually flies anywhere remotely nearby. The only regularly-scheduled (daily) balloon flights happen near Sedona (80 miles away), or Phoenix (150 miles away - where Apex Balloons normally flies). Again, our Grand Canyon balloon flights are a "special order" experience worthy of the extreme price tag (see rates below). Our Grand Canyon hot air balloon adventure flights launch just after sunrise from a location chosen that morning which will allow us to traverse the widest part of the Canyon. We will be thousands of feet up in the air as the sun rises above the horizon, with the best seat in the world to witness the majestic Grand Canyon awakening with the warm hues of daybreak. Each minute brings a dramatic change of scenery as the rising sun paints the canyon walls with ever-changing color. It is a natural show of beauty beyond description. Once in flight, our destination is somewhat of an unknown - it truly is an adventure, as we don't know exactly where we will land until we get there! 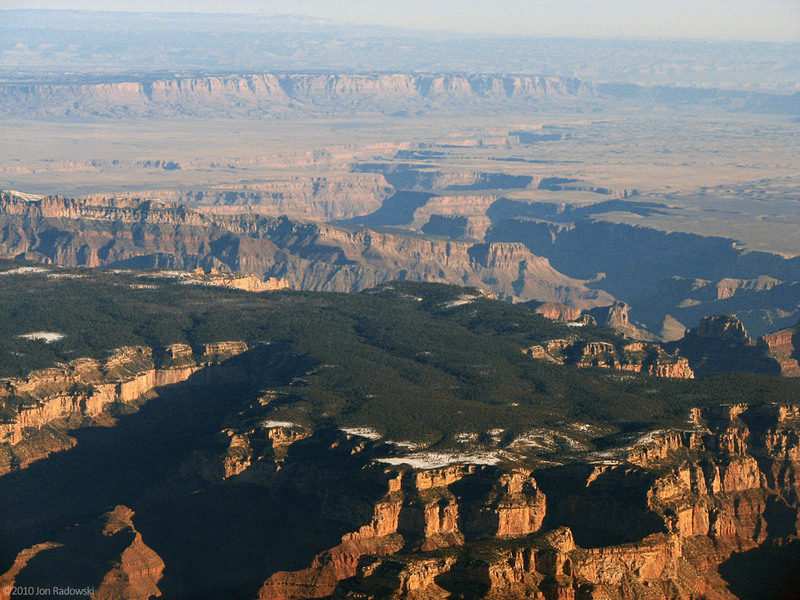 We plan our flights to cross over the widest part of the Grand Canyon, from the South Rim to the north or northeast, or from the North Rim to south. Our distance traveled can vary from 50 to 200 miles or more, depending on wind speed, weather conditions, and landing site suitability. Time in the air may range from two to six hours. Our height will range from just above the desert, to just beneath the maximum permitted altitude of 18,000 feet above sea level. 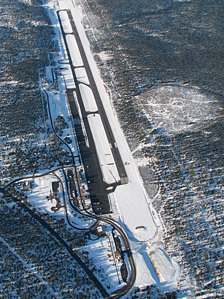 Our average flying altitude while crossing the Grand Canyon will be between 15,000 and 18,000 feet. Above 15,000 feet, supplemental breathing oxygen is available for all passengers, as required by regulations. Your pilot will be breathing supplemental oxygen throughout the flight to stay safe, smart and in accordance with all Federal Aviation Regulations. Due to time in flight, altitudes reached, and possible "extreme" (bumpy) landing conditions, this flight is not for everyone. You must be in good physical condition, able to stand for the duration of the flight, and must be able to walk or hike a reasonable distance. Although we make every effort to land in an easily accessible location, our landing site may be remote and our balloon flight can very well turn into a short hiking expedition after landing. Dress for all temperatures to be expected for the day, and wear multiple layers. It may be extremely cold before sunrise, and will warm up gradually during the flight. A winter hat is highly recommended. Sunscreen and sunglasses are recommended. Sturdy hiking boots are a must, and insulated wool socks are highly recommended. The balloon burners give off quite a bit of heat intermittently. There is almost zero wind chill at cruising altitude, since we are traveling exactly at the same speed as the wind. Because of this, it can get quite warm in the basket on a sunny (but otherwise cold) day. We will have plenty of drinking water and light snacks for everyone on board. Passengers are welcome and encouraged to bring personal food/drink items in a soft cooler. Alcohol and drugs are not permitted on board. 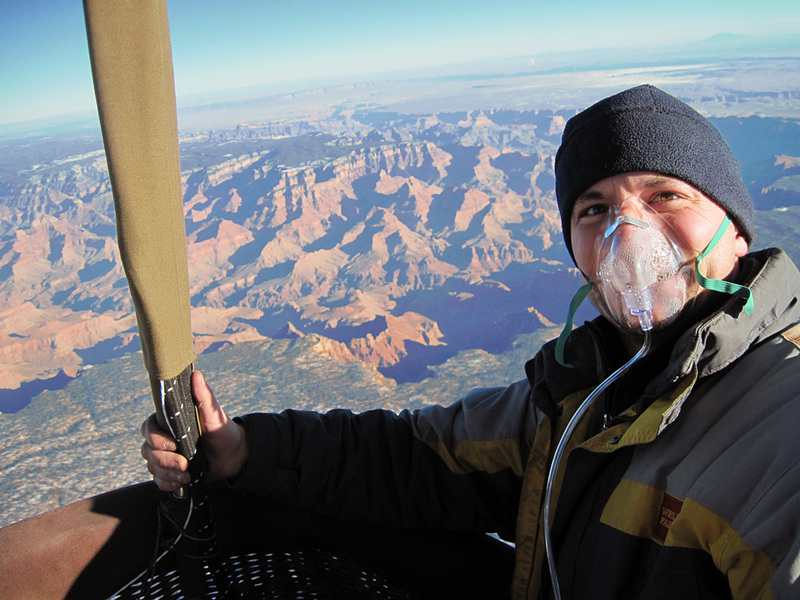 Apex Balloons offers Grand Canyon hot air balloon flights in the winter and early spring months only, from October through March. 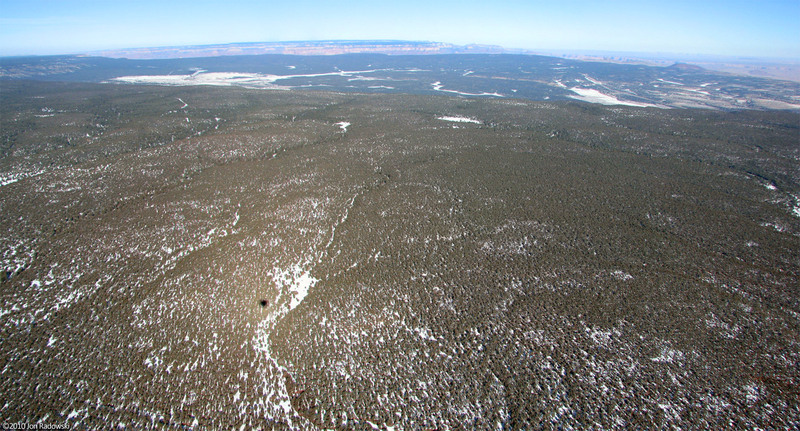 Due to specific weather requirements, Grand Canyon balloon rides are not offered on a regular schedule. This means tourists visiting for a short period of time will probably not necessarily experience an open flight window during their stay. We advise those who are interested in flying with us to coordinate with us as we watch for upcoming weather windows, and then to make travel arrangements to Phoenix at the last minute when a flight weather window is open. Weather conditions must be conducive to a flight, so it is necessary for passengers to be flexible on dates. Reservations are best handled on standby basis - those who are interested in flying will be placed on a standby list and notified when the next upcoming flight window will occur. Weather windows are generally open when the ground winds are very calm and winds aloft are blowing from the south or north at significant speeds. 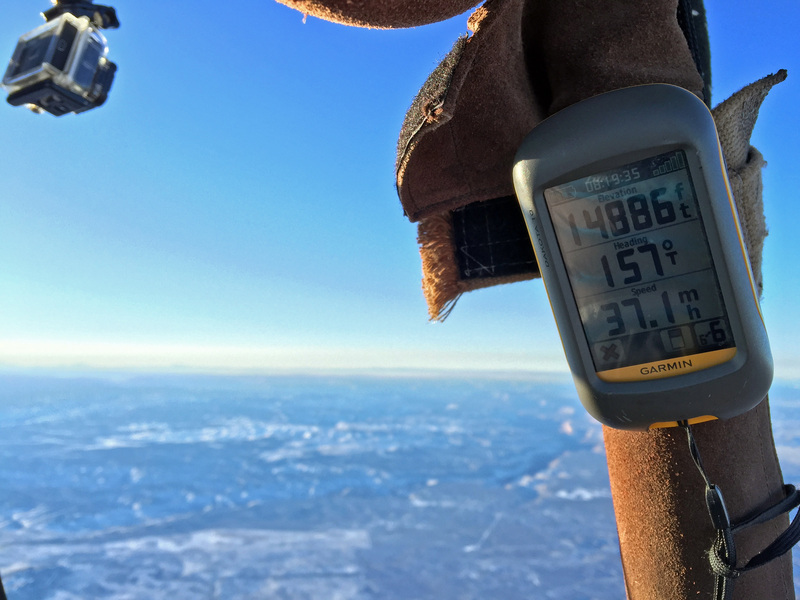 Ideal conditions are calm winds at ground level (less than 6 mph) and significant speed aloft (30-50+ miles per hour at 15,000+ feet). These conditions allow us to have a gentle launch, while picking up speed at higher altitudes in order to make the Grand Canyon crossing and reach suitable landing areas on the north, south, or east sides. Landings are usually "far more exciting" than the takeoff, due to increasing wind speeds at ground level later in the day. The landings can sometimes be quite a thrill ride! Bumping and dragging to a stop, with all on board laughing hysterically at the utterly unique and awe-inspiring experience they've just shared, is a typical conclusion to a Grand Canyon balloon ride adventure. Occasionally we will have feather-soft "standup" landings, but these are generally not to be expected. A Grand Canyon hot air balloon flight is certainly far more exclusive and expensive than a helicopter or airplane tour. There are good reasons. Helicopter or airplane tours are noisy, bumpy, and confined. There is sometimes considerable turbulence involved - motion sickness included. You can't buy silence on an airplane or helicopter tour for any amount of money, and you certainly can't open a window and stick your head and camera out the zooming aircraft to get a better look or clearer photo. On a balloon flight, it is nearly perfectly quiet in between blasts of heat. The basket of a balloon offers an unobstructed view and you are more than welcome to peer over the side, look straight down, hang your camera over the edge, or move around the basket to get the best view possible. Every passenger has a "window seat" with fresh air to accompany it! One of the more unique features of our Grand Canyon hot air balloon flights is the fact that we are not restricted by the 5PM-9AM curfew that airplane and helicopter air tour operators must abide by. We are able to launch at dawn and experience the Grand Canyon in the most prime sunrise hours, avoiding much of the noise and traffic of the helicopter and airplane tour operators which start buzzing over the canyon at 9AM sharp. The vast majesty of this wonderful national treasure can be more appropriately experienced and appreciated through the peaceful silence of a hot air balloon flight. It's a most serene, incredible experience that very few people in the world have ever had the pleasure of being a part of. We're thrilled to offer this incredibly unique adventure, and at the same time, we're still a little bit amazed that we really do this! We look forward to sharing a truly remarkable experience with you. For those staying in the Grand Canyon area, our central meeting location is Grand Canyon National Park Airport. Complimentary hotel pickup/dropoff can also be arranged from anywhere along the I-17 corridor between the Grand Canyon and Phoenix (including Sedona and Flagstaff). Phoenix Sky Harbor International Airport is an ideal pickup location for those flying into Phoenix to begin their experience. Rates shown below are current through March 2017. A $500 deposit is required to reserve a flight date. If we can't fly due to any reason beyond your control (uncooperative weather, etc. ), a 100% refund of the deposit will be given. Full payment via certified funds or cash is required after "GO" flight decision, prior to launch.